Have you ever felt like chucking it all to chase the horizon aboard a cruising boat, but then you hesitated because you thought that this mode of travel was too dangerous? "You're just going to the corner shop to buy some bread. Be careful ... Your risk of being killed is 12 times greater than if you stay at home. Road accidents are the second cause of death, after cancer, but ahead of heart disease. The most dangerous form of transport is the motorcycle and the moped. The second (believe it or not) is walking! Take your life in your own hands! Stay at home and lock all your doors and windows, or sell up and go cruising under sail!" We can't vouch for their statistics, but their willingness to follow their own advice isn't in question: Since the summer of 2000, the Lindbloms have been living full time aboard their 43-foot Swan, Scorpio. 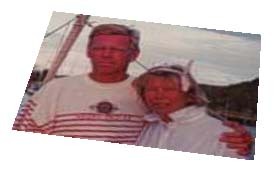 Before that, they spent at least four months each years for eight years living and cruising , travelling 30,000 nautical miles visiting numerous countries. After spending last winter in the Caribbean, the Lindbloms plan to leave Scorpio somewhere in the Chesapeake to return to Finland. "Nothing beats a good summer in Finland", Henrik says, "but we've had enough of the winters. When hurricane season is over, we plan to cruise to Cuba and Central America, then - maybe - transit the Panama Canal."